Here’s a new article about the profits and costs associated with operating a marijuana dispensary by my good friend, and college intern, Skye Robertson. 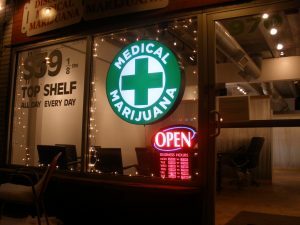 Marijuana dispensary- profits or losses? Plants, plants, they’re good for your health, the more you grow, the more you… take in as annual revenue? Dispensaries in cannabis legal states have been more than profitable in their annual sales and distribution of cannabis products. Some dispensaries in California claim to make upwards of $20 million in a calendar year. This is more than some Apple stores make. Of course, not all dispensaries are making mega millions each year, especially because more and more dispensaries are being opened each year as cannabis is becoming legalized in more and more states. Not even marijuana is exempt from the laws of supply and demand. The more businesses there are, the less business each one gets. Currently, Denver cannabis businesses are facing cash flow crunches due to market saturation which has driven down product prices. That being said, all of this profit may seem enticing enough to make you go out and start your own business; however, the hurdles to jump over to start a dispensary can be sizable enough to compare to mountains. States require a dispensary application which precedes licensing; combined the two can exceed $20,000. After obtaining a dispensary license, owners may be required to obtain a cultivation license for the growing of their products, which can cost a few extra thousand dollars. If these hoops aren’t big enough to jump through, many states require extra fees, and residency in the state before this process can even begin. Add to these costs the onerous effects of IRS Code section 280E and a general lack of banking or conventional loans, and the obstacles to opening a cannabis business can be quite large. Fortunately, cannabis is a growing industry and opportunities abound for the driven and focused businessperson. To help you picture the profits of a dispensary, this is a 2015 graphic from The Marijuana Business Factbook, depicting just how much money a dispensary makes in comparison to other stores. Despite all of the taxes and fees, dispensaries are almost making as money as Nike, Adidas and Under Armour retailers. Regardless of the hurdles and hoops to jump through to open a dispensary, it seems as though the cost of growing a plants is worth it to grow a business, and a states economy. 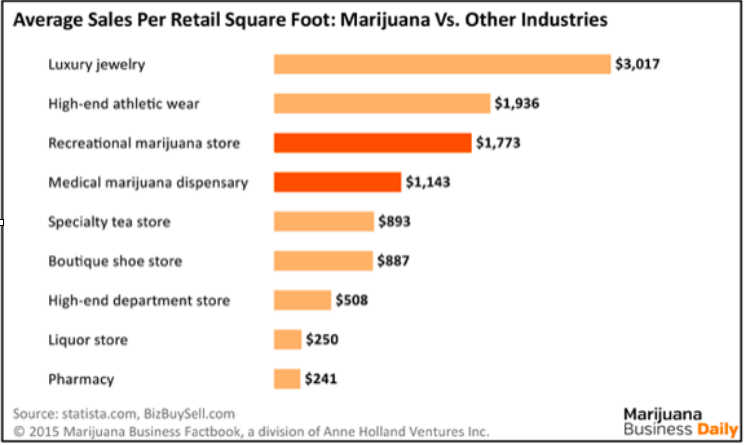 On average, marijuana dispensaries produce more revenue per square foot than most other types of retail stores. ← Did the FDA kill the market for edible CBD? I’ve worked the retail market (brick and mortal – E-Commerce for more than 25 yrs) from everything from merchandiser to buyer. I am currently unemployed. Looking for a change in careers @54. While Ohio hasn’t past recreational use of marijuana, I think this may be a ground floor opportunity. I don’t have much knowledge in this area but am willing to learn and or be a silent partner an Ohio startup store. What are your recommendations on if this is a viable pursuit base on your experience? Gene- Thank you for reading my blog and for commenting. I am glad to hear that you want to get involved in the cannabis industry. It’s a growing industry (pun intended) that needs all sorts of skills- horticulture, marketing, financial, etc. As a lawyer I can’t provide much help in the “what you should do” department; however, I do recommend that you get a good working knowledge of the legal rules. I don’t say this just because I’m a lawyer. Although it’s important to be acquainted with the laws and rules of any industry in which you intend to become involved, this is much more important in the cannabis industry, where the wrong move could land you in jail. There is a lot of good (and bad!) information on the web. I recommend checking out the Hoban Law Group’s blog, Canna Law Blog, and other cannabis blogs written by lawyers. Once you get an idea of the area of industry you want to join please reach out to me directly. I’m happy to give you my feedback. Good luck! How can Las Vegas run out of product in their first week ? Did they not do a projection of prescription, versus product analysis ? This is part of the problem. We have a brewery for every 11,000 people in the US, but how many dispenseries do we have ? Why does congress get involved after the yes vote in Florida was passed, now I have to wait 2 years to get my card, after the vote was passed. Local government is just taking it in its own hands. Thanks for reading and commenting on my blog. You pose a good question: “How can Las Vegas run out of product in their first week?” From the reports I’ve read this is based not on a lack of adequate supplies but on a lack of adequate regulations which would allow, among other things, efficient movement of cannabis products from the producers to the retailers. This is a classic case of a failure of regulation to address the supply chain rather than a poor estimate of demand. As States “go online” and legalize cannabis it is vital that proper and robust regulations are in place. What about in Michigan a start up company out here. It sounds like it could be a good idea. Feel free to reach out to me confidentially if you have any questions: 828-255-9881 or [email protected].